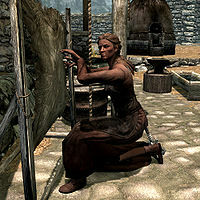 Adrianne Avenicci is an Imperial blacksmith who runs Whiterun's armory Warmaiden's with her husband Ulfberth War-Bear. She is the daughter of Proventus Avenicci, the steward for Jarl Balgruuf the Greater. On the topic of her father she will add: "You think all the council my father provides the Jarl is his alone? Hmph. Let's just say I advise the advisor, and leave it at that." Ulfberth explains the significance of their store's name when you ask him who forges the wares: "Adrianne. At her forge, just outside. Place is named after her. "Warmaiden's." It's a childhood nickname, given by her father. What I hear, she was playing with swords even back then." Adrianne also has respectful admiration for competitor Eorlund Gray-Mane, who works at the Skyforge, as she points out: "I don't claim to be the best blacksmith in Whiterun. Eorlund Gray-Mane's got that honor. Man's steel is legendary. All I ask is a fair chance." She wears a blacksmith's apron and shoes, and carries around a steel mace, along with some common loot and the key to Warmaiden's. She wakes up at 6am, after which she can be found outside her shop smithing for 11 hours, while her husband runs the shop inside. She offers her services from 6am to 8pm at her forge. The interior shop, which carries different merchandise than she does, is open from 8am to 8pm. At 5pm, she goes inside where she can be found eating or resting after a hard day's work. At 8pm closing time, she goes out for a long walk around Whiterun until midnight, when she'll return home to sleep. For a list of wares she sells, see the Warmaiden's page. Her work in Whiterun has not gone unnoticed, as guards may point you towards her shop: "Need a blade? You should talk to Adrianne, at the forge." Her husband Ulfberth speaks highly of his wife, as one of his greetings states: "Most of our weapons were crafted by Adrianne Avenicci. My woman's an artist, is what she is." If you stick around the shop, he may also remark: "Everything you see here was made with skill and care by my wife Adrianne." Her father Proventus may also mention her upon greeting you: "I'm kept so busy, I don't get to see my daughter as often as I'd like. Perhaps you've met her? Adrianne? She owns the shop, Warmaiden's." "I just can't fill an order that size on my own." Idolaf: "We'll pay whatever it takes. But we must have more swords for the Imperial soldiers." Adrianne: "I just can't fill an order that size on my own. Why don't you swallow that stubborn pride of yours and ask Eorlund Gray-Mane for help?" Idolaf: "Ha! I'd sooner bend my knee to Ulfric Stormcloak. Besides, Gray-Mane would never make steel for the Legion." Adrianne: "Have it your way. I'll take the job, but don't expect a miracle." Like any good merchant, she will frequently remind you of her wares as she greets you: "Got some good pieces out here, if you're looking to buy. More inside." Similarly, she may do so when you end the conversation: "Don't forget to check inside the shop if you need anything." She may also mention her father upon greeting you: "Have you met my father? He's the steward, up at Dragonsreach." You can ask her what she can tell you about Whiterun, after which she replies: "Hmph. Plenty. I'd say we're prosperous enough. Most folk don't go hungry, if they're willing to work hard. The city's ruled by the Jarl up in Dragonsreach. That's the fortress, there, up on the tall hill. But you're probably more interested in Jorrvaskr, mead hall of the Companions. Their deeds of war and valor are... legendary." If you haven't already asked Alvor in Riverwood, or Lod in Falkreath, you can ask her if she needs help around the forge, which starts a minor blacksmithing tutorial in which she asks you to perform every part of smithing. When you ask her if she works the forge all day, she'll ask for a small favor as she admits: "Aye, that I do. I've got to, if I hope to be as good as Eorlund Gray-Mane some day. In fact, I just finished my best piece of work. It's a sword. I made it for the Jarl, Balgruuf the Greater. It's a surprise, and I don't even know if he'll accept it. But... Listen, could you take the sword to my father, Proventus Avenicci? He's the Jarl's steward. He'll know the right time to present it to him." Should you accept and hand the sword over to Proventus, he will mention: "Ah, this must be that weapon for the Jarl. Poor girl, so eager to prove herself. I'll present it to Balgruuf when his mood is... agreeable." 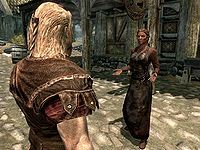 Independent of this mini-quest, Proventus may be seen talking to the Jarl about Adrianne's sword: "My daughter Adrianne wants to forge a new sword for you. Now, it wouldn't be a Skyforge blade, I know, but she really is quite gifted..."
Should you have helped taking over Whiterun after having sided with the Stormcloaks, you can ask her whether things have changed since the Stormcloaks are in charge, after which she will admit: "Well, not a great deal, no. But I do less business than I used to. The Stormcloaks don't like buying from anyone that isn't a Nord. If I wasn't married to Ulfberth, I'd be out of business." In that case, she may mention her father when she greets you, though now accordingly stating: "Have you met my father? He was the steward, up at Dragonsreach when Balgruuf was Jarl." Should Eorlund Gray-Mane come to pass during your time in Skyrim, her dialogue regarding him will update: "I don't claim to be the best blacksmith in Whiterun. Eorlund Gray-Mane was that and more, but now he's dead. All I ask is a fair chance." Similarly, if she should perish, asking Ulfberth now who forges the weapons and armor causes him to admit: "Since Adrianne's death, I've had to buy them from the Khajiit caravans. Tried making some myself, but I'm no good with the forge and anvil. Anyway, our wares are strong and the prices fair. What else matters?" Greatsword for a Great Man: Adrianne asks you to deliver a sword to Proventus Avenicci, her father. She is part of two separate merchant factions: one for outside, and one for inside Warmaiden's. While you can barter with her outside, she offers different services with Ulfberth inside. This means the merchant gold she has outside is independent of the gold she has inside. Therefore, male characters with the Speech perk Allure are advised to barter with her when she's inside, instead of bartering with Ulfberth. A Gentleman's Guide to Whiterun incorrectly refers to Adrianne as a Nord. This page was last modified on 9 April 2018, at 00:40.